MPPEB Middle School Teacher Recruitment 2018: Madhya Pradesh Professional Examination Board (MPPEB) has issued Recruitment Notification 2018 for 5670 Middle School Teacher Posts. All interested, Eligible and Aspiring Candidates can Apply On-line on or before 12th October 2018 (12/10/2018). The detailed information such as Name of Posts, Total No of Posts, Pay Scale & Grade Pay, Educational Qualification, Age Limit, Application Fee, Selection Procedure, How to Apply, Last Date for Submission of Application Form etc. can be obtained further either by visiting Madhya Pradesh Professional Examination Board (MPPEB) Official Website http://www.peb.mp.gov.in/ or by Continue reading…. Educational Qualification – Candidates should have completed Graduation Degree with B.Ed / B.El.Ed / B.A.Ed / B.Sc.Ed or its equivalent qualification from a recognized university. 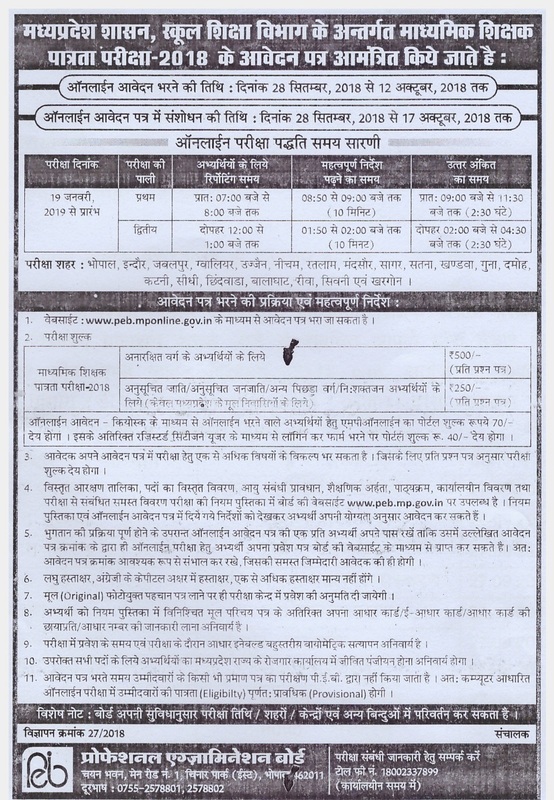 However for further educational qualification details, candidates can see the detailed advertisement. Selection Procedure – All Interested, Eligible and Aspiring Candidates who are applying for MPPEB Middle School Teacher Recruitment 2018 will have to appear in Written Test and your final score will decide your fate. How to Apply – All Interested, Eligible and Aspiring Candidates who are applying for MPPEB Middle School Teacher Recruitment 2018 will have to visit Madhya Pradesh Professional Examination Board (MPPEB) Official Website http://www.peb.mp.gov.in/ and fill the On-line Application Form. Date for Online Test – 17 January 2019.